One week back I was reminded that my Editorial page was due for Volume 9 issue 1 as the magazine was ready to go for print. It suddenly struck me Volume 9! I sat back and drifted to 2001 when SINDHISHAAN was conceived and the Inaugural issue was released on Cheti Chand and thereafter the first issue Volume 1 issue 1 – September – November 2001. 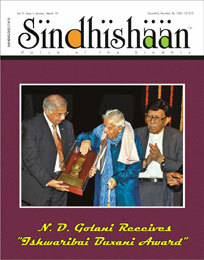 SINDHISHAAN is a 9 year old publication! The problems we face is not Sindhi specific but prevalent in most Indian communities, although that should not be taken as a consolation. The advantage we have over the other communities is we are smaller in number, but way ahead in financial clout. And considering these factors our task should be relatively simpler, if we are to sincerely apply ourselves. AND I BELIEVE WE WILL. In this issue I have presented the contrarian views of youth and the frustration, to the point of throwing up our hands, felt by the current generation in trying to keep native culture and heritage alive. At the same time there is the springing of hope and a whiff of fresh air emanating from random quarters, gathering momentum, as it were. Also featured are efforts at compromise by the elder generation trying to be pragmatic and not taking a holistic stand on the matter of script and relenting to consider the Roman Script for Sindhi. Trust this issue will make for interesting reading.